LINCOLN, NE, 10-Sep-2016 — /EPR INDUSTRIAL NEWS/ — Z3 Technology, LLC, a leading provider of embedded video compression systems, and Sony Electronics Inc., an international leader in image sensors camera technology, are announcing the availability the Z3Cam-4KTM, a 4K H.265 IP camera leveraging Sony’s FCB-ER8300 4K camera. The Z3Cam-4K brings clarity and detail to high movement and low light conditions with optimized 4K technology. This unit captures stunning video with 20x optical zoom with integrated auto focus. The Z3Cam-4K provides crystal clear images for broadcast, industrial, medical, security and corporate applications while adding the ability to broadcast and analyze your video around the world. The Z3Cam-4K is the first 4K video system capable of encoding and streaming 4K H.265/HEVC video with ONVIF integration for easy camera management. 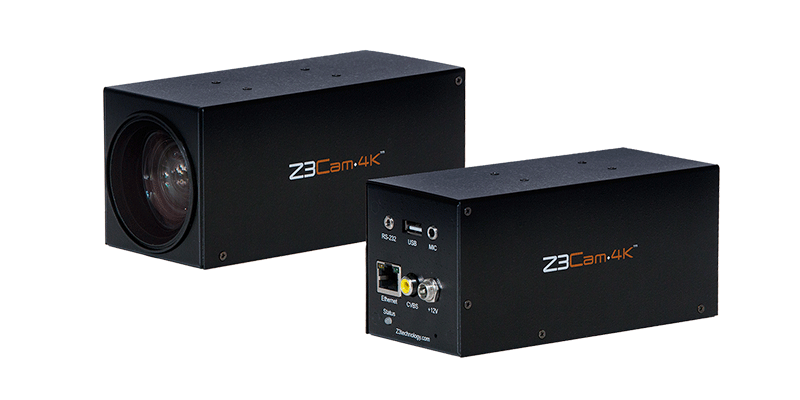 The innovative Z3Cam-4K has multiple options for your IP transmission. The system can output both H.265/HEVC and H.264 video over IP in 4K resolutions. It can also send a simultaneous HD stream. Camera control can take place remotely with VISCA control commands sent over IP to the Z3Cam-4K from a comm port on your PC. Where seeing sharp lines is key, Sony’s 4K noise reduction algorithm provides the highest quality imaging fit for virtual reality imaging and high detail data analytics. “Sony is privileged to work with Z3 on providing the 4K optics and image capture subsystem integrated into the Z3Cam-4K. With fast auto focus, 20x optical zoom and electronic image stabilization we expect this new camera to be deployed widely in demanding commercial and industrial 4K applications,” said John Monti, Director, Sony Visual Imaging Solutions. Z3 Technology is a Sony Authorized Integrator and is a leader in the embedded video market with focus on OEM ready system-on-modules and technology transfer licensing. More Industrial Press Releases & News from Europe.